So this Manga Browser…? It lets you, uh, browse manga? Today, there is an impressively large faction within manga fandom that is eternally dedicated to the pursuit of cheap (as in, free, if not entirely legal) manga on the internet. 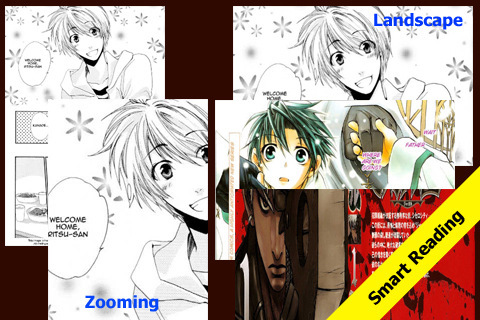 You can find dozens upon dozens of “fansites” that carry scans of manga titles, both uber-popular and obscure. A few mega-sites, like Mangafox.com and MangaReader.net, carry hundreds of titles to peruse at your leisure, and the Manga Browser app seeks to optimize your reading habits by funneling all of these sites into one place and giving you a dedicated manga browsing experience. So what does that actually mean? Basically, Manga Browser sidesteps pesky (and expensive!) licensing issues by creating an interface that takes you to some of the larger third-party manga websites, lets you download the chapters you want from the websites, and Manga Browser gives you a built-in viewer to read ’em with. In other words, it does exactly what every other browser already does, it just bookmarks all the major sites for you and cleans up the interface a little bit, although not nearly as much as it should. Because Manga Browser is just directing you to free content it finds on the internet, I expected the browsing experience to be near flawless, but instead it was disappointingly clunky and tedious. Of course, you must have a stable internet connection to make use of this app at all, but rather than neatly aggregating the sites’ contents, Manga Browser forces you to visit each site individually and click around within the site until you find the manga you want, at which point you must then painstakingly favorite each one using Manga Browser’s system and then manually download each specific chapter you’re interested in. Once you’ve got a manga downloaded and have managed to find the viewer, things go a little smoother, but the interface is still a little painful. You can read either in portrait or landscape mode, but while portrait mode has reasonably smooth scrolling, page transitions, and zoom, landscape mode does this horrendous screen snap action that lets you just continuously scroll down through the whole chapter, but it makes the screen feel like it has an awkward stutter, forcing you to halt in weird places between panels. Because they’re not hosting manga themselves, the Manga Browser developers presumably keep their hands clean, although the sites they access, because of their dubious legality, may get taken down at any moment, like the much lamented OneManga.com. Although the current batch of sites is holding steady, if they went down, this would effectively break Manga Browser’s functionality, and there’d be nothing they could do about it. I’m certainly not going to condemn anyone who decides to check out the latest issue of Bleach online, but don’t kid yourself into thinking that Manga Browser is anything other than a more complicated form of copyright violation. The $1.99 app fee doesn’t actually buy you the rights to all that manga, so do yourself a favor and skip the app and just go find the manga online like the rest of the pirates. AppSafari review of Manga Browser, Downloader & Reader was written by Tracy Yonemoto on January 25th, 2011 and categorized under App Store, Bookmarks, Books, iPad apps, Reading, Universal. Page viewed 4592 times, 2 so far today. Need help on using these apps? Please read the Help Page.